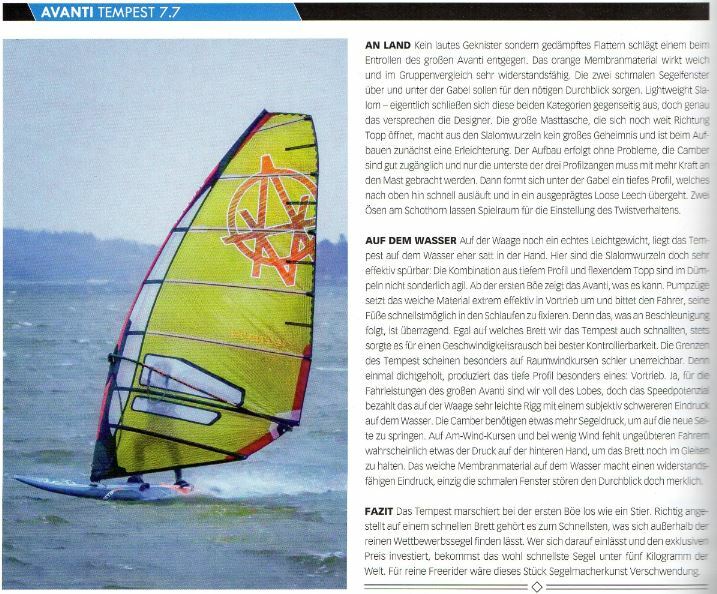 Finally we are receiving the first official feedback from the Magazines in Germany on the Tempest. 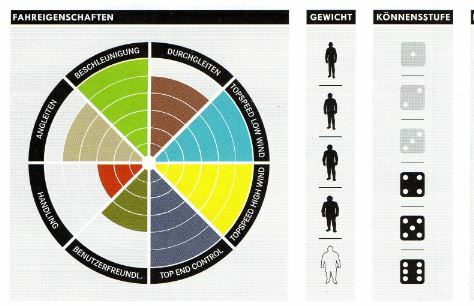 This long highly anticipated test falls in line with our expectations and with those found by French Windmag last year. No loud crackling but dampened flapping as we unroll the great Avanti. The orange membrane material looks soft and in this group comparison, very resistant. The two narrow window panels above and below the boom should provide the necessary see-through. Lightweight Slalom, actually these two categories are normally not in the same range, but that’s what the designers promise. The large mast Sleeve, which runs high towards the mast top, makes no attempt to hide this sails slalom roots and also makes the sail easy to rig up.The rigging of the sail is effortless with easy access to the cambers, only the bottom cam needs a bit more effort to get on the mast before all 3 profile inducers are set on the mast. With the third camber on the mast a deep profile forms under the boom which runs towards the top where it turns into a nice loose leech. Two outhaul grommets allow for plenty of trim options. On the scale the sail is a true light weight, where on the water The Tempest feels rather full in the hand. Here are the slalom roots are easily recognized: The combination deep profile and loose leech doesn’t feel particular agile when not in planning. From the first gust the Avanti shows what it can and requests the sailor to hook in and get in the straps as fast as possible because what follows is an amazing acceleration. No matter which board we used the Tempest on, we always got a speed rush from the sail combined with easy controllability. 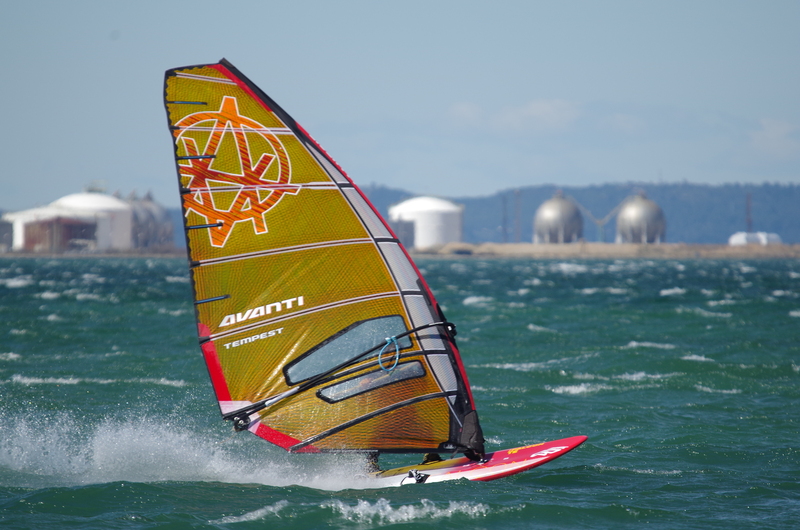 Especially on a downwind course the top speed of the Tempest seemed limitless. One thing that is sure, once you close this sail, the deep profile of the sail generates one thing and that is propulsion. Yes, for the sail performance of this big Avanti we are in awe. But we feel the speed potential for this (on the scale) very light rig is being paid for with a slightly heavier feel on the water. The cambers need a little extra sail-pressure to switch following a jibe. On upwind courses and in less windy conditions, the untrained sailor probably lacks some pressure on the back hand to keep the board flying. The soft membrane material makes a strong impression on the water, only the small disturb the view. The Tempest marches on from the first gust like a bull. When used on a fast, it is one of the fastest sails which can found outside the pure competition sail ranges. Who gets involved and invests the exclusive price, gets the fastest sail in the world under five kilograms.